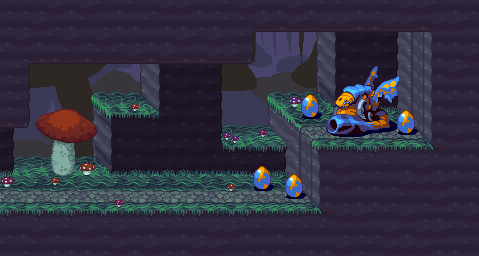 Ambrosia is a 2D platformer with Mega Man-paced action and Metroidvania-styled exploration. It stars Iris, an explorer and engineer who travels to the distant island of Aspida to find her friend, Gus. Along the way, she will contend with the island's defenders, robots of the powerful Ambrosia Corporation, and unlock the island's deepest secrets. The real meat of Ambrosia, however, is our weapon customization system. As Iris explores the island, she will outfit herself with an array of weapons, from the experimental pulse breaker to traditional rifles and revolvers. Ever the inventor, Iris is able to tinker and fiddle with her weapons using schematics found throughout the island to unlock powers and abilities beyond the weapon inventor's wildest imagination! In other words, the player can change up their weapon behaviors to exhibit a variety of different possibilities. Do you want a larger, more powerful pulse blast, or a weaker blast that spreads over a larger area? Do you want a slower reload with an armor piercing rifle round or the ability to double your magazine size? And when each weapon has multiple behaviors that can be modified, and when those modifications have a cumulative effect on each other, things really get interesting! Although we're not ready to announce the funding needs or backer rewards quite yet, rest assured we are looking for ways to show our support for all our fans - even those who can't afford to fund! If you are reading this, we appreciate you. You have no idea. Really. It means a lot. And we hope you will get to play Ambrosia soon, and love your time with it when you do!